THE SHOOT OF THE FILM IS NOW FINANCED. ARRIVING TO OUR SECOND GOAL WE CAN TAKE OUR FILM TO POST PRODUCTION. 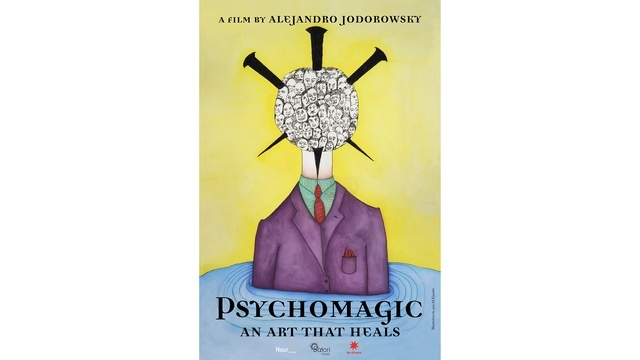 Psychomagic, an art that heals will be the most complete film on the therapeutic work of Alejandro Jodorowsky. It will show by means of real acts what Psychomagic is, its principle, how it is practiced and operates on beings. The people behind the acts are real suffering people and eager to solve their problems through the use of Psychomagic. Photogram of a Psychomagic act from La Danza de la Realidad film by Alejandro Jodorowsky (2013). - Freeing oneself from fear of darkness. Many diseases, neuroses, and various sufferings emerge for psychological reasons, where Psychomagic acts on the unconscious through theatrical acts. For many years this therapy for the unconscious has been practiced and has given striking results. 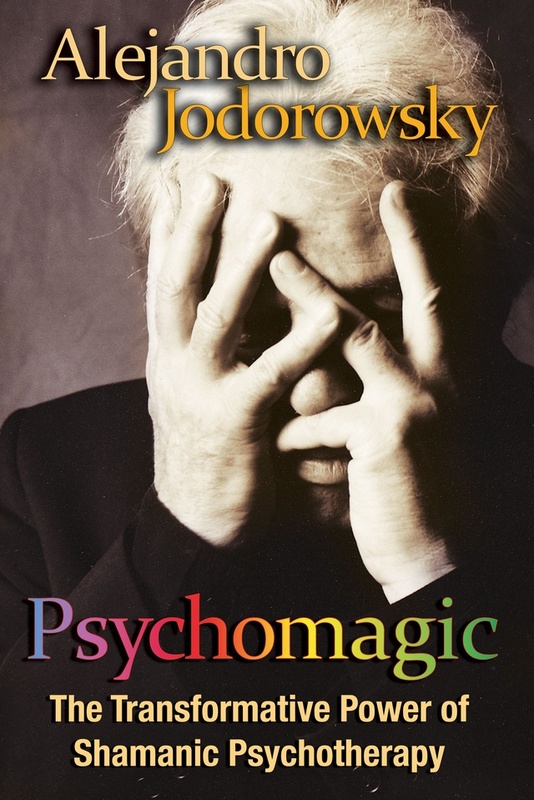 Psychologists and psychiatrists apply the work of Alejandro Jodorowsky on their patients. Artists and filmmakers have also been inspired by this therapy for their work. Photogram from La Danza de la Realidad - Freeing oneself from dark thoughts. We follow the people throughout their healing process, in their first testimony, the realization of their act, then finally their conclusion and the effects of the acts some time later. The Psychomagic acts should impact the unconscious in order to be efficient. Thus, they are often impressive and highly cinematic. With the film Psychomagic, an art that heals, Alejandro wants to go further than ever before, transcending fiction by filming reality, but a heightened reality, magical and healing. There will not be any actors, only real people that have expressed their suffering and their will to heal from it. For this film will be a manifesto, through its humanist intention, and it’s artistic stance. The use of real elements, without any artifice or any actor, it’s spiritual content, it’s means of production, directed and filmed by a small and passionate crew, essential to preserve the authenticity and integrity of the film’s action. "The necessity for expression is more important than the type of film you want to make. I make a film when I have something I need to express. I don’t think about investors, industries or commercialisation. I just need to express myself." “What I do is not to earn my life, it is to express myself. I’m not forced to sell, I made my films because I had something to say. I search within myself to find what’s best within others. I believe that cinematographic art is like a door for the people watching the film, a door for them to find their true self. I will thus tell you what you know but that you don’t remember” - Alejandro Jodorowsky. 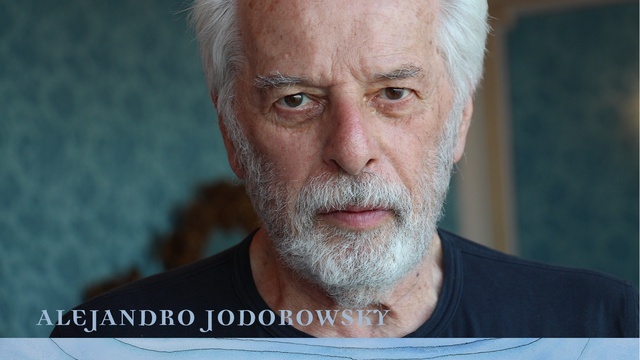 To help us produce Jodorowsky's new film, we need your help. Photogram from El Topo - Transition from childhood to adulthood. 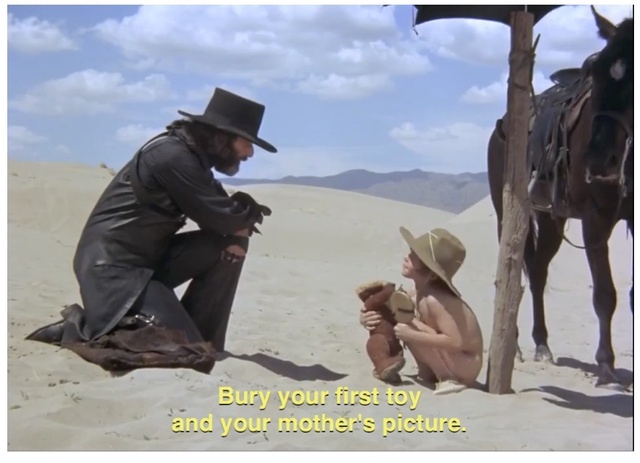 Every Wednesday, for years, Alejandro Jodorowsky has given psychomagical advice for free in a café, in Paris. While doing this healing work, he has created and prescribed different psychomagical acts to help people solve their problems. 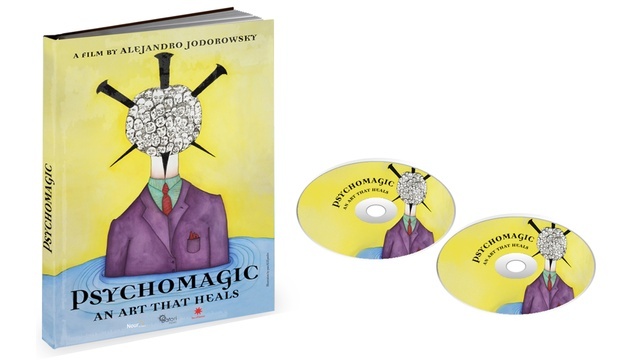 This book contains testimonies of healings thanks to psychomagical acts, transcriptions of readings and exclusive documents that have never been published before. 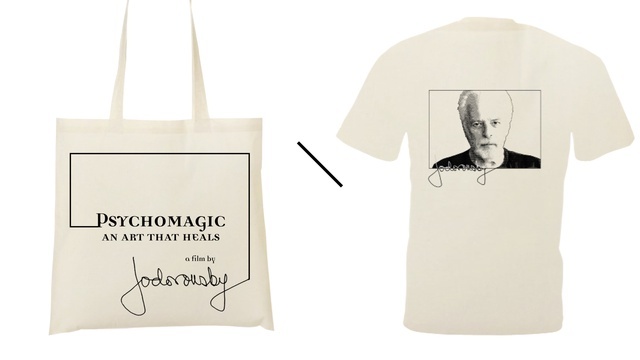 An exclusive tote-bag and a T-shirt at the effigy of Alejandro Jodorowsky. Black silk screen impression on white textile. Not only is our poetic money a symbolic currency, it is a cryptocurrency. This means that this currency has a real digital exchange value. If your reward contains Dinero Poetico bills, then you will receive an e-mail detailing the instructions on how to active the cryptocurrency online. 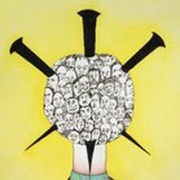 An artwork by pascALEjandro, printed on A3 poster. King Shot: A stalled metaphysical spaghetti western film project, which would have been co-produced by David Lynch and starred Nick Nolte, Marilyn Manson, Udo Kier and Asia Argento. 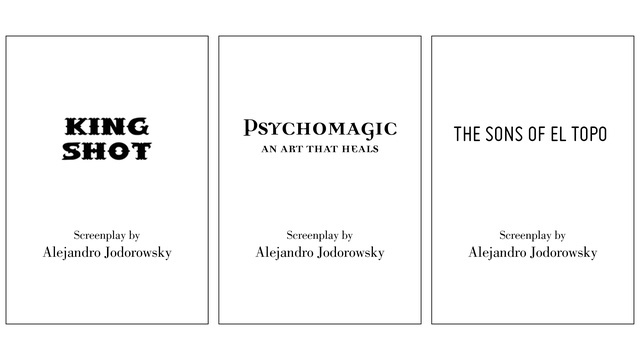 Psychomagic, an art that heals: The first draft of the script, a unique insight into Alejandro Jodorowsky's creative process. 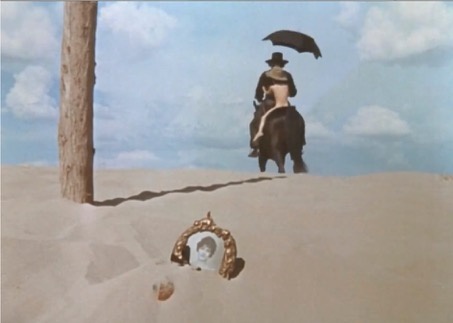 The Sons of El Topo: Sequel to the mythical El Topo that Alejandro never shot though he is currently adapting it to a comic book. Box containing all of the perks (T-shirt, tote-bag, poster) and all of the Poetic Money bills (1x100, 1x50, 1x10, 1x1 redeembale in our cryptocurrency) and the digibook (expected delivery in 2019). Clapboards used during the making of the films La Danza De la Realidad,Psychomagic: an art thats heals, and Poesia Sin Fin, all of them signed by Alejandro Jodorowsky. A copy of the original Dune script, never shot. Limited copies. 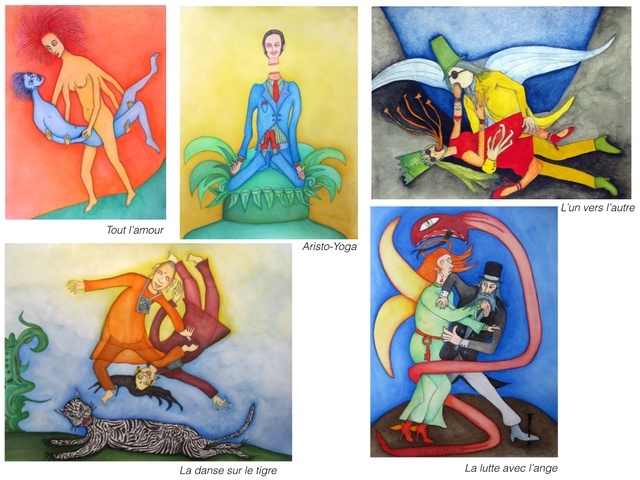 Unique reproduction for each artwork by pascALEjandro, with a selection of 10 reproductions. (pascALEjandro is the shared oeuvre by Alejandro Jodorowsky and his wife Pascale Montandon-Jodorowsky: pascALEjandro is their symbolic child and a pure collaboration). Alejandro is drawing and Pascale puts the colors. "It was in the spring of 1979 that one of the most intense adventures of my life began, which would lead me to create a therapeutic and artistic system based on the study of the family tree.I thought that if feelings provoked postures, a posture could trigger emotions. I invented a method of bodily expression that began in a fetal position, frightened (desire to die), and ended with the flourishing of the human being, arms wide open, connected to the cosmos (euphoria of living). Very quickly, I realized that innumerable memories were written in our body: memories of childhood or the prenatal period, acceptance, rejection, psychic residues of various members of the family. The practice of pantomime with Marceau, trantric yoga and chakras, Chinese medicine and meridians, the Kabbalah and the application of sefirot to the body: all these practices led me to develop my consciousness. I came into contact with my subconscious, which I no longer regarded as a danger but as an effective ally. I created a therapeutic technique that I called Psychomagic, consisting in staging in everyday life into a healing act, like a dream, to release an unconscious blockage. 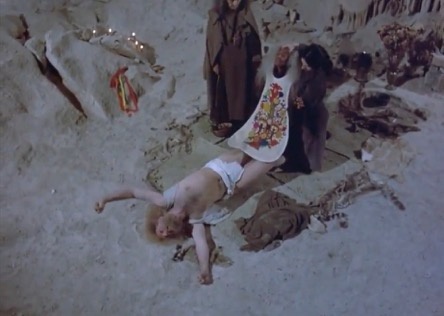 I wanted to teach the intellect the language of the unconscious, mostly composed of images and actions that defy logic. Speech reveals a problem but does not cure it. The only words that can heal the unconscious, because it does understands them, are prayer and incantation. To transform him into a protective ally, it is necessary to seduce him by means of acts of a theatrical or poetic nature. Just as the unconscious accepts placebos, he accepts metaphorical acts. The impulses are not solved by sublimation but by an act that realizes them symbolically. All illness comes from an order received in childhood that compels us to do something that does not correspond to us, and a prohibition that forces us not to be what we are in reality. The evils, the depressions, the phobias and the fears can result from a lack of conscience, from a family tyranny. A psychomagic act is thus a precise theatrical and metaphorical scenario, which the consultant must implement by his own means. Photogram from El Topo - Rebirth. Hello! Do the copies of the Dune script offered here with this campaign include art by Moebius and others, as seen, in part, in the documentary film, “Jodorowsky’s Dune”? I am very happy and excited to support this project regardless, but I am curious if this perk is the text of the script alone, or if it is inclusive of the many design and art elements as seen in the documentary. Thank you! It is the version without illustrations, thank you so much for your support! Hi there! I am interested in supporting the project and I would really like a copy of the DVD of the movie. 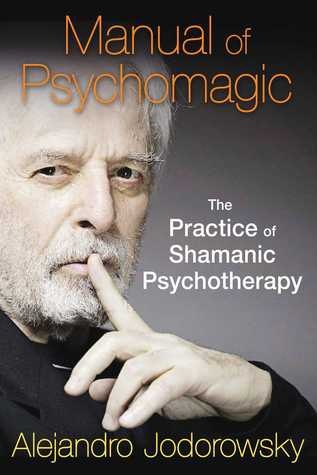 Is it included in the Psychomagic box 130 EURO tier? Thank you for your your support! Does the Dune script perk come with the digibook & dinero? Or just the script alone? 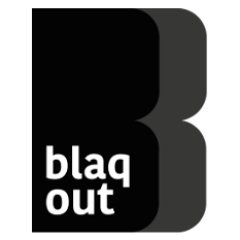 Looks like an amazing project. Excited to support it. Yes as soon as we achieve 100,000 euros, our goal, we will send poetic money with the script. Hello! 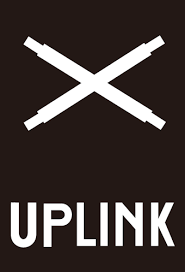 I am very excited and happy about the project. I would like to read Dune's script and also have Psychomagic box. Does "*EXCLUSIVE* Copy of Dune's script" come with Psychomagic box or it is separated? Thank you really much for your enthusiasm! I supported through purchasing an autographed poster. I am wondering if any other, lower level, perks were included? (Like being included in the mosaic or a copy of the manifesto?) Or are those separate purchases? Looking forward to this & Essential Trip. Which categroy did you choose? What are the dimensions for the autographed poster? Will the Blu-ray/DVD and the Digibook contain multiple languages and subtitles? 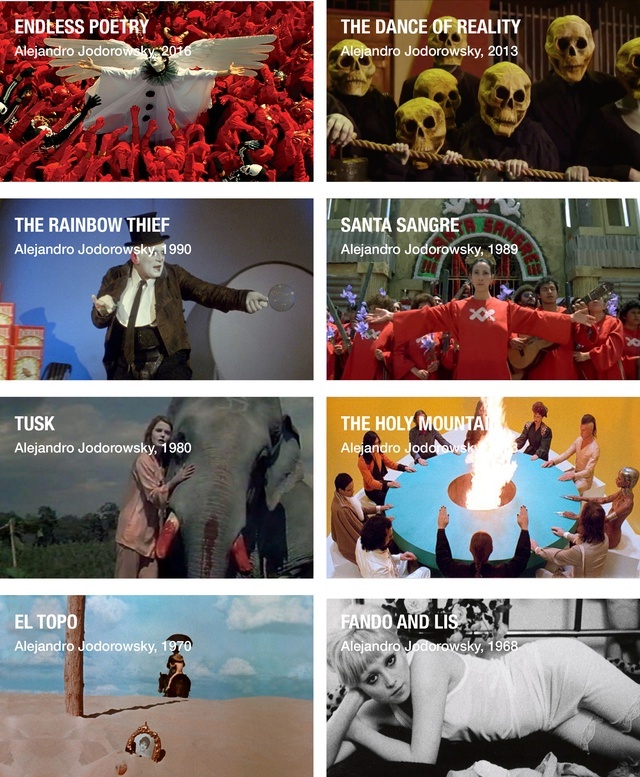 The philosophy behind Alejandro Jodorowsky's cinema, in form of a digital manifesto. Your name will appear in the film's ending credits in a mosaic. One Dinero Poetico bill of 1, and two Dinero Poetico bills of 10 (1x1, 2x10), redeemable in our cryptocurrency. The choice between any of the articles listed below, a T-shirt, a tote-bag, a poster (A3), Dinero Poetico (5x1, 2x10, redeemable in our cryptocurrency), or Jodorowsky's manifesto (A4), numbered and certified. The DVD of the film and Dinero Poetico bills (10x1, 2x10, redeemable in our cryptocurrency). 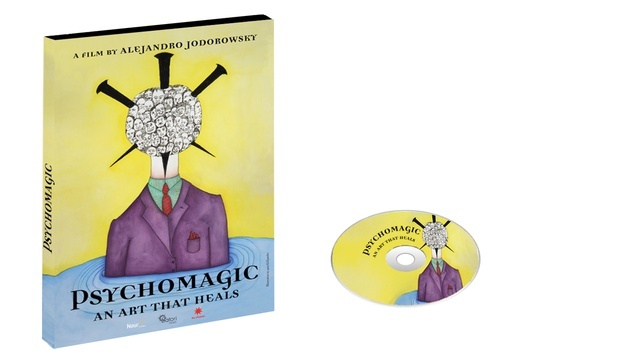 A collection of psychomagic experiences and the DVD of the film, with exclusive bonuses and Dinero Poetico bills (5x1, 4x10, redeemable in our cryptocurrency). 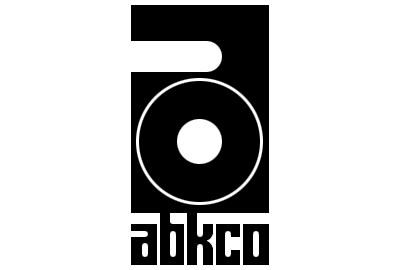 The DVD of the film, with the new Dinero Poetico bill 1x50, 1x10, 1x1, redeemable in our cryptocurrency, and the choice between any of the articles below; a T-shirt, a Tote-bag, a Poster (A3), or Jodorowsky's manifesto, numbered and stamped. 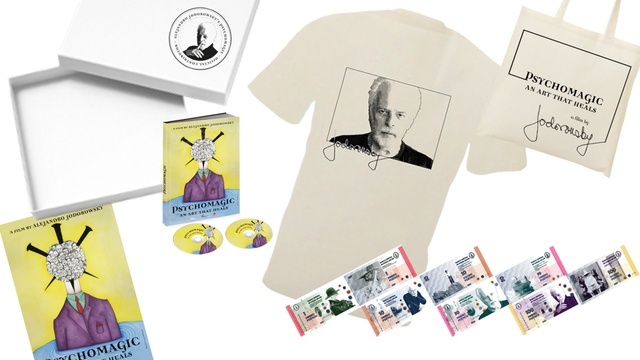 The digibook, the Dinero Poetico bills (1x50, 1x10, 1x1, redeemable in our cryptocurrency) and the choice between any of the articles below; Tote-bag, Poster, Jodorowsky's Manifesto (numbered and certified), and a T-shirt. 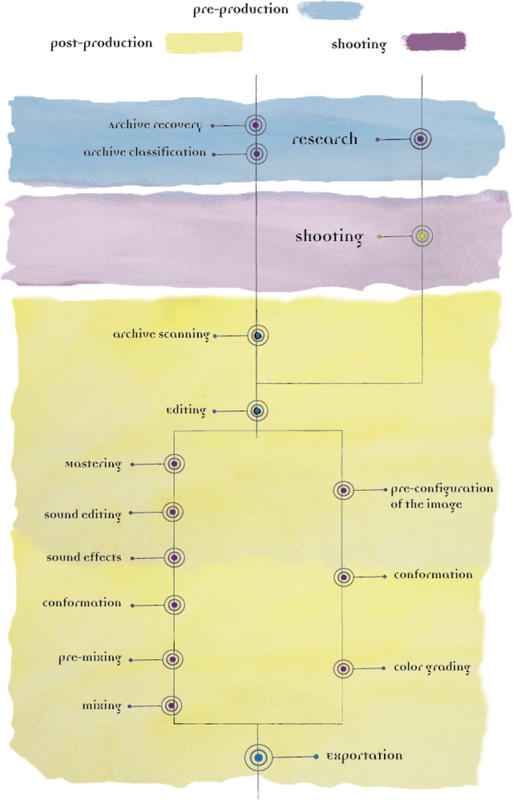 The digibook, and the choice between a script written by Alejandro Jodorowsky's in PDF form (protected by a password). Box containing the digibook, all of the Dinero Poetico bills (1x100, 1x50, 1x10, 1x1 redeemable in our cryptocurrency), all of the articles (Tote-bag, Poster, Jodorowsky's Manifesto (numbered and certified) and a T-shirt). 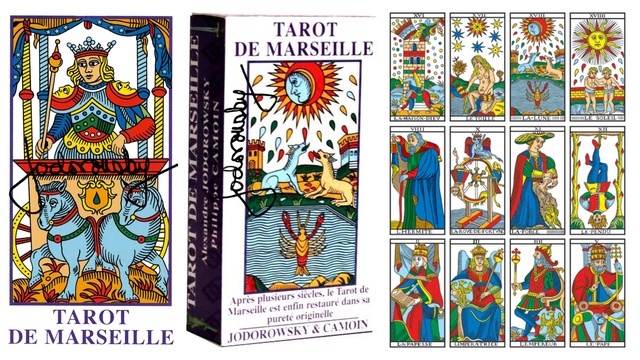 The choice between the poster of the film Psychomagic: an art that heals (A3), a Tarot de Marseille by Jodorowsky and Camoin, a book on Psychomagic (Psychomagic or Psychomagic manual), signed by Alejandro Jodorowsky. 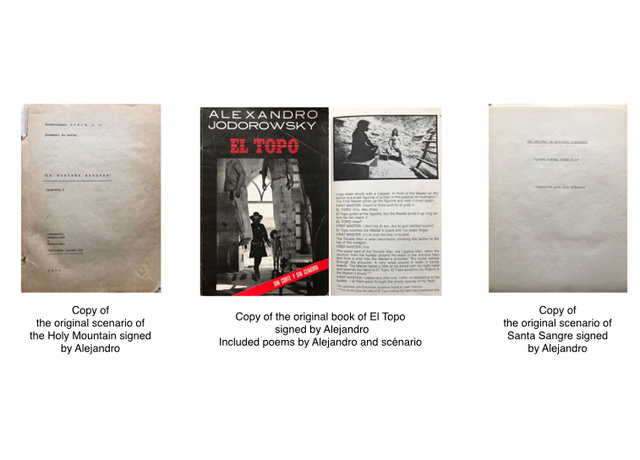 Signed copies of scripts of mythical films by Alejandro Jodorowsky. 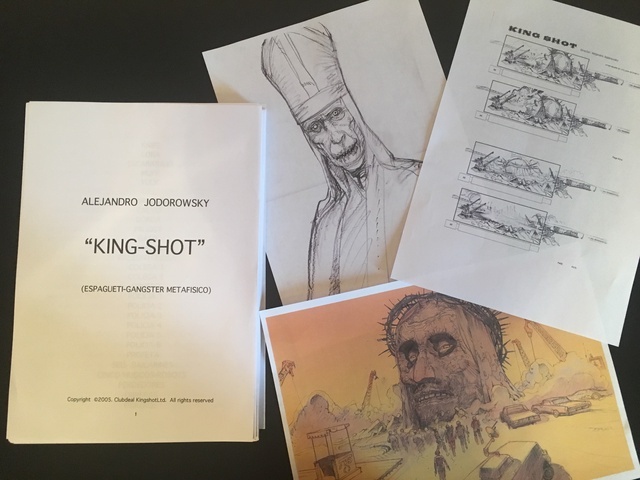 Signed copies of scripts of King Shot never made by Alejandro Jodorowsky with special illustrations and storyboard. Signed copy of the script of the mythical film by Alejandro Jodorowsky. 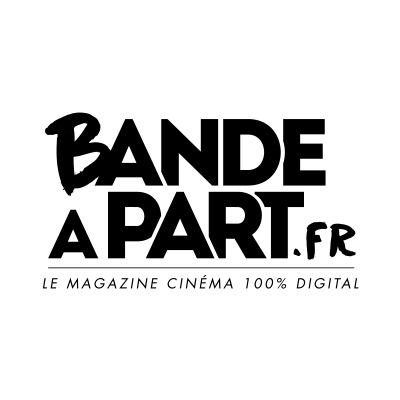 Two tickets for the film premiere in Paris. 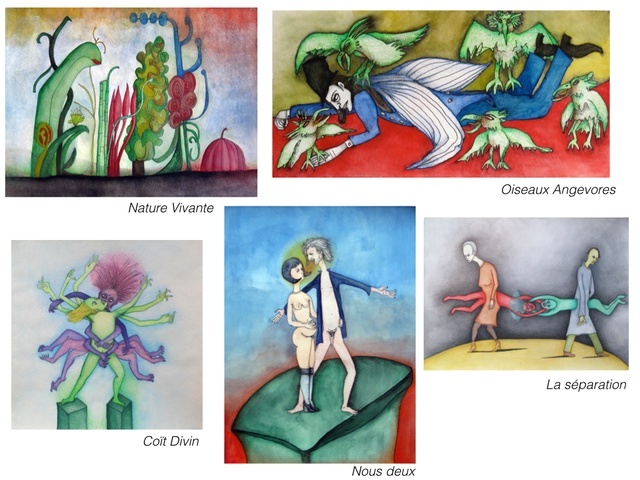 Unique reproduction for each artwork by pascALEjandro, with a selection of 10 reproduction. 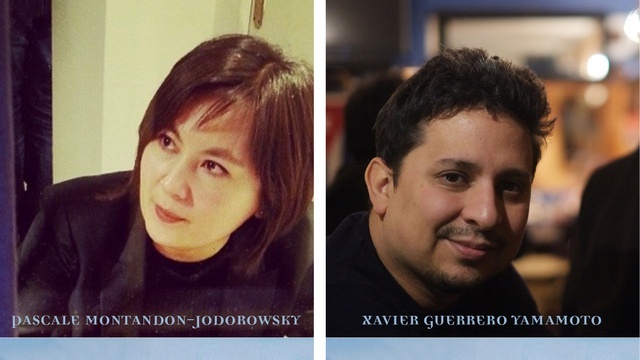 (pascALEjandro is the shared oeuvre by Alejandro Jodorowsky and Pascale Montandon-Jodorowsky). Clapboard used during the making of the film Psychomagic: an art that heals, Poesia Sin and La Danza de la Realidad, signed by Jodorowsky, and the sum of the money paid in Dinero Poetico bills (redeemable in our cryptocurrency). (expected delivery of the clapboards in September 2018). A special mention in your name will appear in the film's ending credits. Facsimile of the original Poesia Sin Fin script in Spanish, annotated by Alejandro Jodorowsky during the making of the film. Facsimile of the original Dance of Reality script in Spanish, annotated by Alejandro Jodorowsky during the making of the film. 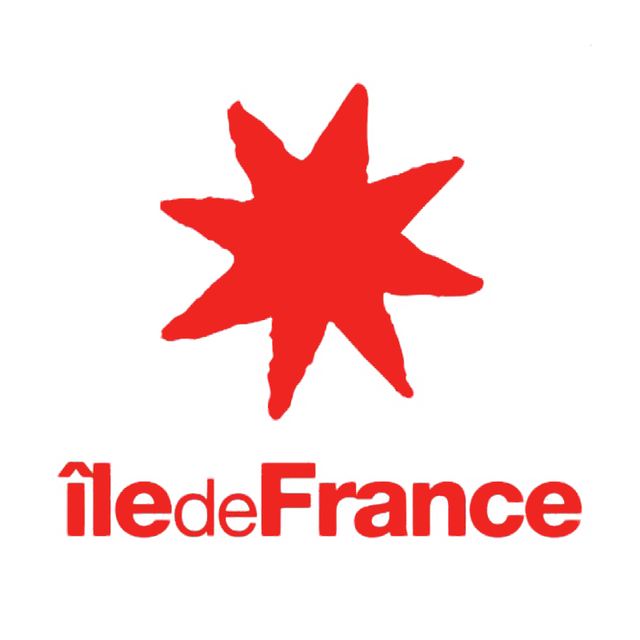 One ticket for the film premiere in Paris. 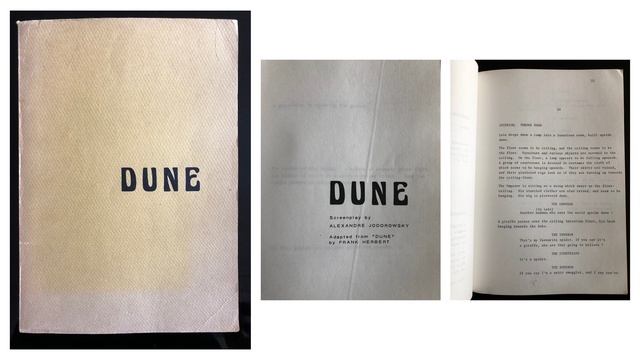 LIMITED COPIES OF THE DUNE SCRIPT AVAILABLE JUST FOR YOU! Signed copy of the script of the mythical film by Alejandro Jodorowsky, never shot. 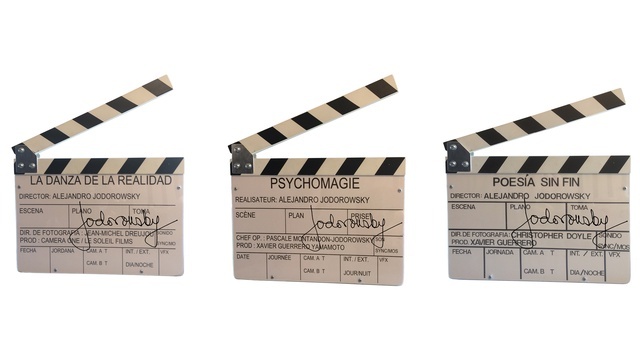 Mini clapboard used during the making of the film Psychomagic: an art that heals signed by Alejandro Jodorowsky and the sum of the money paid in Dinero Poetico bills (redeemable in our cryptocurrency). 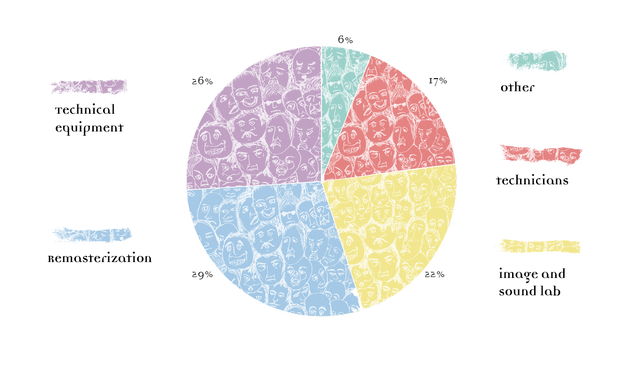 (expected delivery of the clapboard in September 2018). Clapboard used during the making of the film Psychomagic: an art that heals signed by Alejandro Jodorowsky and the sum of the money paid in Dinero Poetico bills (redeemable in our cryptocurrency).